Sen. John McCain (R-Ariz.) talks to reporters after a vote on health care legislation, on Capitol Hill in Washington, July 26, 2017. 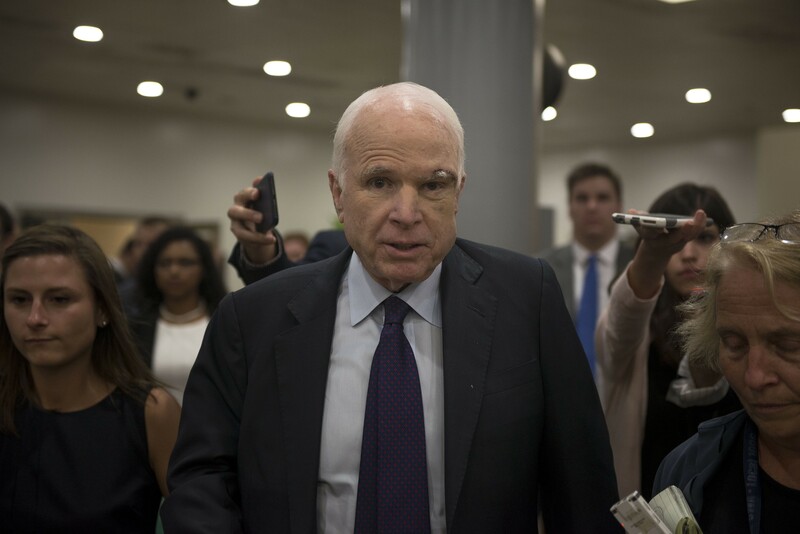 McCain and six other Republicans joined Democrats in refusing to repeal major parts of the Affordable Care Act without a replacement on Wednesday; the 45-55 defeat signaled that a “clean repeal” bill cannot get through Congress. WASHINGTON — In a statement that began by highlighting their past conflicts, President Donald Trump expressed his respect Monday for Sen. John McCain, adding that he had ordered the White House and all public flags to be flown at half-staff in honor of the Vietnam War hero and two-time Republican presidential candidate. Trump spent much of Monday declining several requests by journalists to comment publicly on the death Saturday of McCain after a yearlong battle with brain cancer, adding to the ire from veterans groups and critics that grew around his conspicuous silence and apparent delay in ordering the White House flag lowered to half-mast. The president, whom McCain had previously said was not invited to his funeral services, said other senior aides would attend memorial events in his place. They will be John F. Kelly, the White House chief of staff; John Bolton, the national security adviser; and Defense Secretary Jim Mattis. McCain, 81, who had survived a Vietnam War prison camp and weathered the gradual coarsening of politics within his own party, appeared to have a sense of how the day might unfold. For the last time, the fiery Arizona senator stepped in to call for patriotism over politics when Trump would not. In a posthumous statement delivered through a top aide, McCain issued a pointed rebuttal of Trump-era politics, although he never mentioned the president by name.